​2015 Pembroke Welsh Corgis were ranked #20 for Most Popular Dog Breed in America. The Pembroke Welsh Corgi has a shoulder height of 25-30 cm (10-12 in) and weighs up to 15 kg (30 lbs); it is almost twice as long as it is tall. The Pembroke Welsh Corgi has a flat skull and large, high-set, erect, rounded ears. 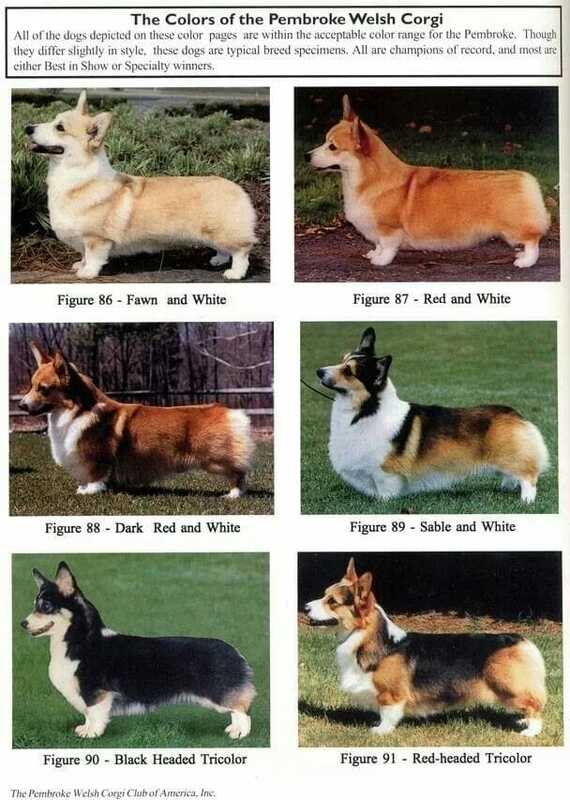 Pembroke Welsh Corgis have a docked or natural bob tail; the natural bob tail is coming more into fashion as some countries ban the practice of docking. The Pembroke Welsh Corgi is distinguished from the Cardigan Welsh Corgi by its smaller size, absence of a long tail, and generally more fox-like appearance. The Pembroke Welsh Corgi has a long, thick, water-resistant outer coat consisting of hard straight hairs, and a short undercoat. It can be red, sable, fawn, or black and tan, all with possible white markings on the legs, chest, muzzle, or blaze (vertical line between the eyes). White should not exceed 30 percent of the coat. The Pembroke Welsh Corgi may also have a ‘fairy saddle’ of hair on the shoulders pointing in a different direction to the rest of the coat. The Pembroke Welsh Corgi is an energetic dog that bonds quickly with its family. It is brave, intelligent, alert, and self-confident. The Pembroke Welsh Corgi is slightly less aggressive and less boisterous than the Cardigan Welsh Corgi. It barks occasionally and makes a good watchdog. Pembroke Welsh Corgis are good with children as long as they are respected; some tend to nip at the heels. Pembrokes can get along well with cats and other pets if socialized when young, but may not be fond of other dogs. The Pembroke Welsh Corgi is somewhat suspicious around strangers and must be trained not to growl. Pembroke Welsh Corgis can be domineering over one another. The Pembroke Welsh Corgi should be brushed occasionally to remove dead hairs, and bathed only when necessary. It has a life expectancy of 11-13 years. The Pembroke’s long body shape makes it susceptible to spinal problems and arthritis. Obesity in the Pembroke Welsh Corgi can lead to serious health conditions, so proper nutrition and exercise is critical. Another potential health problem for the Pembroke Welsh Corgi is Canine Degenerative Myelopathy, which may be present if the dog stands with its feet abnormally close together. The Pembroke Welsh Corgi can live outdoors but prefers to split its time between life indoors with the family and playtime in the yard. The intelligence of the Pembroke Welsh Corgi makes training fairly easy. Pembroke Welsh Corgis are eager learners and quickly understand what is expected of them. The Pembroke Welsh Corgi excels at dog sports such as sheepdog and agility trials. Its paws should be handled frequently when it is a puppy to help it overcome its natural resistance to paw grooming. The Pembroke Welsh Corgi has an abundance of energy, requiring more exercise then its size indicates. Pembroke Welsh Corgis enjoy agility training and games of Frisbee catch. The Pembroke Welsh Corgi should not be made to jump from significant heights (even a few feet) or run for great distances because of its long back and short legs. It doesn’t mind apartment life as long as it is sufficiently exercised. The Pembroke Welsh Corgi descends from a crossbreeding of the Cardigan Welsh Corgi with either the Schipperke and Pomeranian or the Swedish Vallhund, which travelled to Wales with the Vikings. It is the smallest herding breed. ‘Cor gi’ translates to ‘dwarf dog’ or ‘gathering dog’ in Welsh; the rest of the Pembroke Welsh Corgi’s name comes from its birthplace of Pembrokeshire, Wales. Originally used as a hunter and guard dog, the Pembroke Welsh Corgi was later trained to herd cattle and sheep. The Pembroke Welsh Corgi was not used as a show dog until the 1920’s, and then met with only mild success. It was recognized as a distinct breed from the Cardigan Welsh Corgi in 1934, which led to a gradual increase in popularity. By 2006 the Pembroke Welsh Corgi had become the 22nd most registered breed with the American Kennel Club, far outnumbering the Cardigan variety. Famous Pembroke Welsh Corgis include ‘Ein’, the genius dog from anime ‘Cowboy Bebop’, and Stephen King's Pembroke Welsh Corgi ‘Marlowe’, who ‘Oy’ from ‘The Dark Tower’ series is based on. The Pembroke Welsh Corgi is also highly popular with British royalty; Queen Elizabeth II. Peferred breed of Queen Elizabeth ll, who has owned more than 30 corgis durring her reign. Copy & Paste Link in your browser for more Corgi Information!